Beautiful washed out blues walked across the runway for Giorgi Armani’s spring/summer 2019 show, and you too can follow the same path for a fraction of the cost. Style Advice: To recreate the washed out denim blues of Giorgio Armani’s spring/summer 2019 runway show, focus on finding garments that can connect with one another seamlessly. First, you’ll be looking to purchase a slightly bright undershirt that can compliment the rest of the outfit, so be sure to pick up the FairPlay Cory Knit Tee ($34) from Urban Outfitters to get off on the right foot. While you’re at the store, but sure to grab the UO Small Metal Oval Sunglasses ($18) as it’s a key accessory to the look that’s worth choosing carefully. Once that is all said and done, be on the lookout for washed out blues from the likes of Zara. While at their store or online site, pick up the Indigo Rustic Blazer ($149), as it is the perfect layer to compliment your t-shirt and start to tie together the identity of the outfit. Also, be sure to grab the Textured Weave Suit Pants ($80) and the Leather Belt ($40), as that will complete the entirety of your look besides the shoes. When it comes to a pair of sneakers, I’d recommend the Zara Black High Tops With Fleece Lining ($90), as its futuristic look will fit perfectly with any recent runway presentations. Must Have: Balenciaga has recently released a three set of Chevaliere rings in three types of colors, including Gold/Blue, Black/Silver and Gold/Red. The rings feature a Balenciaga logo engraved on their inner bands as well as black trim with logo and graphic engraved upon the face. These three pieces are Italian made and available on the SSENSE website for $395. A beautiful mix of class and boastfulness, this is a must have accessory for anyone looking to make a confident statement. 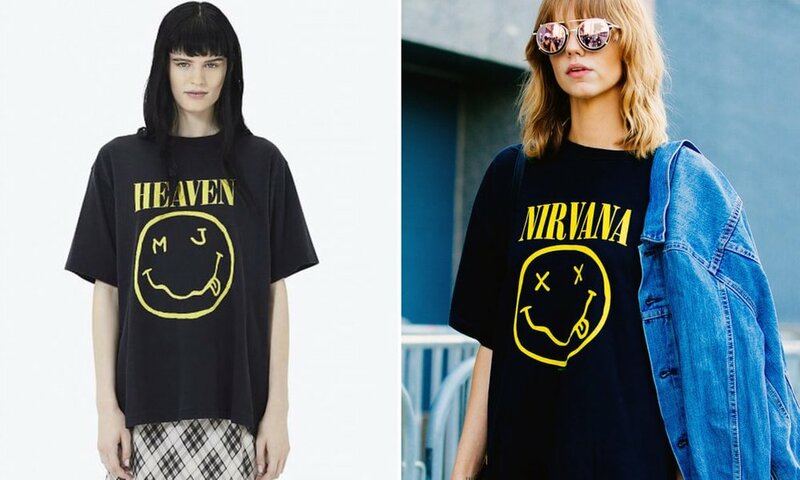 Industry Update: 90’s grunge band Nirvana is reportedly suing Marc Jacobs for copyright infringement after the designer used remarkable likeness of the band’s iconic yellow smiley face for one of his outfits. The garment was titled the “bootleg grunge” t-shirt, an obvious reference to Nirvana’s classic merchandise designs. “This exclusive piece from the 1993 Grunge collection was created by Marc Jacobs during his time at Perry Ellis. This bootleg smiley tee sure smells like teen spirit,” says the official website, further admitting to the root of the shirt’s inspiration. The piece still remains on the Marc Jacobs website and across multiple retailers, as the brand is yet to respond to grunge band’s lawsuit as of today.